Join us for our first ever Renaissance Pup Block Party! Email info@susanbearddesign.com if you’re interested in sponsoring this event! We are inviting you, your fiance, and your friends and family to a complimentary fun, fast paced, and playful class on classic posing techniques. Event includes hors d'oeuvres and wine. Turn an ordinary photograph into an extraordinary work of art! 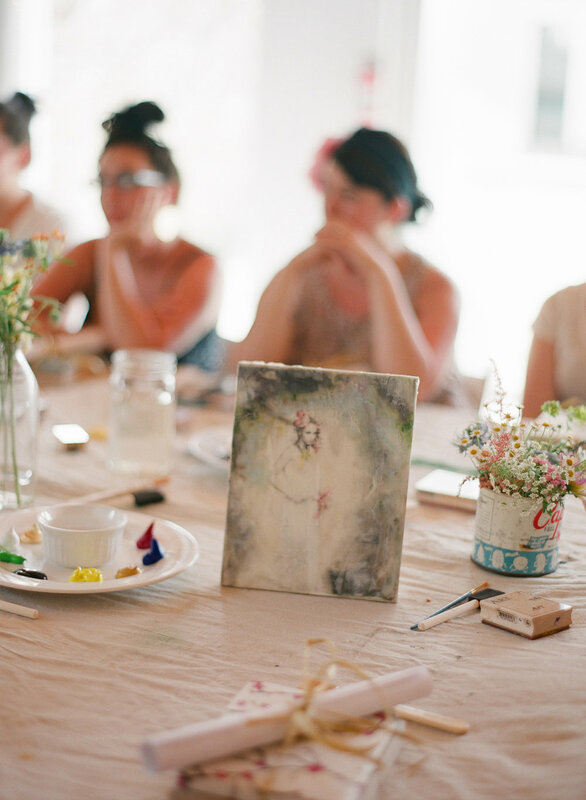 Ignite your inner artist… explore the limitless creativity of Encaustic Painting. Layers of beeswax + stencils + paint. No experience necessary. Includes: vino, demonstration by a skilled encaustic artist and a 6x6 photograph ready for you to transform. Join us for our first ever Couples’ Workshop, where you and your significant other will come together to collaborate on painting a single photograph with beeswax and paint. You will be challenged to work together on ideas to enhance the meaningful photograph you both chose to paint together. Included is dinner and wine for a lighthearted and romantic evening!